Made in France, probably in Rheims, about 820-840, this manuscript has a copy of a famous poem on the constellations and planets. The result of several layers of translation and being added to, the poem is a late Roman version of a Latin translation done in the 1st century BCE by Cicero. Cicero had translated a Greek poem written in the 3rd century BCE by Aratus. Hence, it was known as the 'Aratea'. The illustrations which accompany it in medieval manuscripts follow what was probably an ancient tradition. This manuscript is known to have been at St Augustine's monastery, in Canterbury, by the end of the 10th century. By that time, Anglo-Saxon interest in natural science, which can be seen three centuries earlier in Bede's writings, had gained widespread support by Anglo-Saxon ecclesiastics in their program to elevate the level of education for clergy and monks. Natural science was understood with the framework of Christian doctrine, although it represented a secular facet of their knowledge. Sirius, in Greek mythology, was the dog of the hunter, Orion. The constellation includes the star Sirius, the 'dog star', which is the brightest star in the skies. In this copy of the 'Aratea', the constellation Sirius is shown with rays shining from his head, indicating the bright star that heads the constellation. 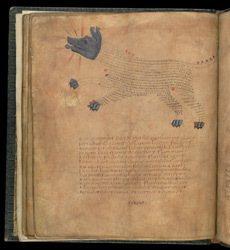 Sirius' body is formed of the words of a later addition to the 'Aratea', called the 'scholia', which give further information about the dog and the star. The scholia were always written within the body of the constellation. In this manuscript, the head and feet are beautifully painted, while in others they are drawn. The handwriting style of the scholia imitates a type of ancient Roman handwriting.